Download "1. IMPORTANT NOTICE 2. LICENSE OF SOFTWARE PROGRAMS. 2.1. License Grant"
1 RAPID FOCUS SECURITY, INC. DBA PWNIE EXPRESS END USER LICENSE AGREEMENT FOR ENTERPRISE PENTESTING APPLIANCE (EPA), PWN PLUG, PWN PLUG WIRELESS, PWN PLUG 3G, PWN PLUG ELITE, PWN PHONE, PWN PAD, PWN PLUG MINI, AND POWER PWN SOFTWARE 1. IMPORTANT NOTICE PLEASE READ THE TERMS AND CONDITIONS OF THIS END USER LICENSE AGREEMENT (THE AGREEMENT ) CAREFULLY BEFORE PROCEEDING TO USE THE RAPID FOCUS SECURITY, INC., DBA PWNIE EXPRESS ( PWNIE EXPRESS ) SOFTWARE PROGRAMS AND THE ASSOCIATED DOCUMENTATION (THE SOFTWARE PROGRAMS ). 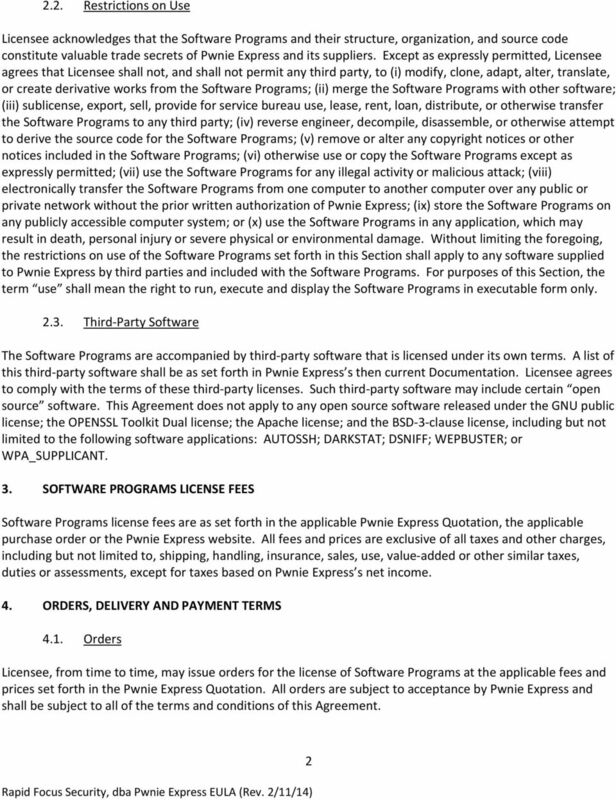 PWNIE EXPRESS HAS DEVELOPED AND OWNS OR HAS THE RIGHT TO LICENSE THE SOFTWARE PROGRAMS. THE SOFTWARE PROGRAMS ARE COPYRIGHTED, PATENTED OR PROTECTED BY TRADE SECRET LAW AND THEIR USE IS LICENSED (NOT SOLD) TO YOU (EITHER AS AN INDIVIDUAL, CORPORATION, OR OTHER ENTITY) AS A LICENSEE. BY USING THE SOFTWARE PROGRAMS OR ACKNOWLEDGING I ACCEPT, LICENSEE ACCEPTS AND AGREES TO THE TERMS AND CONDITIONS OF THIS AGREEMENT. IF LICENSEE DOES NOT AGREE TO BE BOUND BY THE TERMS AND CONDITIONS OF THIS AGREEMENT, LICENSEE SHOULD NOT USE THE SOFTWARE PROGRAMS. THIS AGREEMENT APPLIES TO PWNIE EXPRESS ENTERPRISE PEN TESTING APPLIANCE, PWN PLUG, PWN PLUG WIRELESS, PWN PLUG 3G, PWN PLUG ELITE, PWN PHONE, PWN PAD, PWN PLUG MINI, AND POWER PWN SOFTWARE OR OTHER SOFTWARE PROGRAMS DESIGNATED BY PWNIE EXPRESS. 2. LICENSE OF SOFTWARE PROGRAMS 2.1. 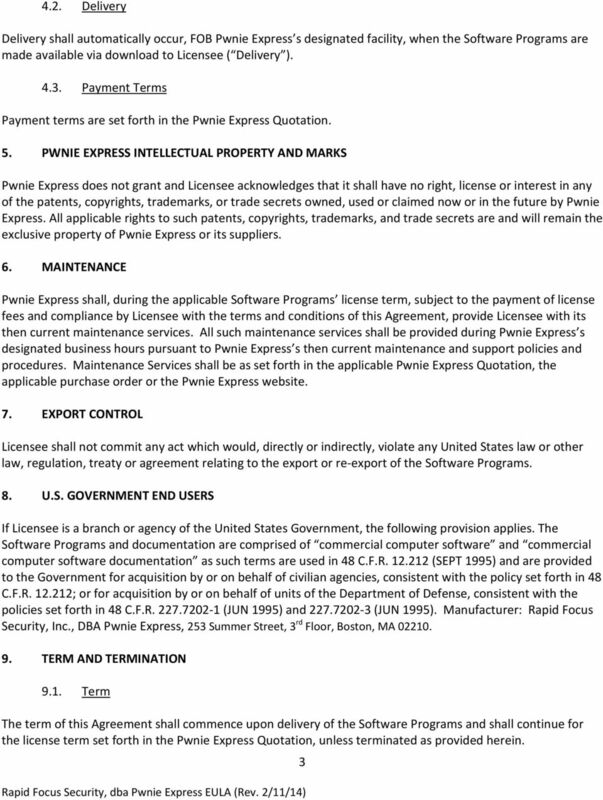 License Grant Subject to the terms and conditions of this Agreement, including the payment of license fees, Pwnie Express grants to Licensee during the designated license term a non-exclusive, nontransferable license to execute and run the Software Programs, in object code form only, solely for internal business purposes and not for any commercial purposes. Licensee acknowledges that the Software Programs have been designed and are intended to be used solely and exclusively for the purpose of testing the security of the Licensee s computer network and/or systems. Licensee agrees that (i) it is authorized to access such computer network and/or systems and any and all data contained therein; and (ii) it is authorized to perform such security testing. Licensee agrees that it shall not use the Software Programs for any illegal purposes or for any purpose other than as expressly set forth in this Agreement. Licensee shall indemnify and hold harmless Pwnie Express from any breach of the terms and conditions of this Agreement. The license grant may include, as set forth in the applicable Pwnie Express Quotation or the purchase order, Software Programs embedded in an appliance without any maintenance services; an appliance with Software Programs embedded and maintenance services provided; or, a designated number of appliances connected to a central hub, which shall manage designated remote devices. TERMS AND CONDITIONS ACCEPTANCE OF ANY PURCHASE ORDER FROM A CUSTOMER FOR USE OF ANY EQUIPMENT AND SOFTWARE PROVIDED BY RX MONITORING SYSTEMS INC. ( RXMS ) IS CONDITIONED UPON THESE TERMS AND CONDITIONS. 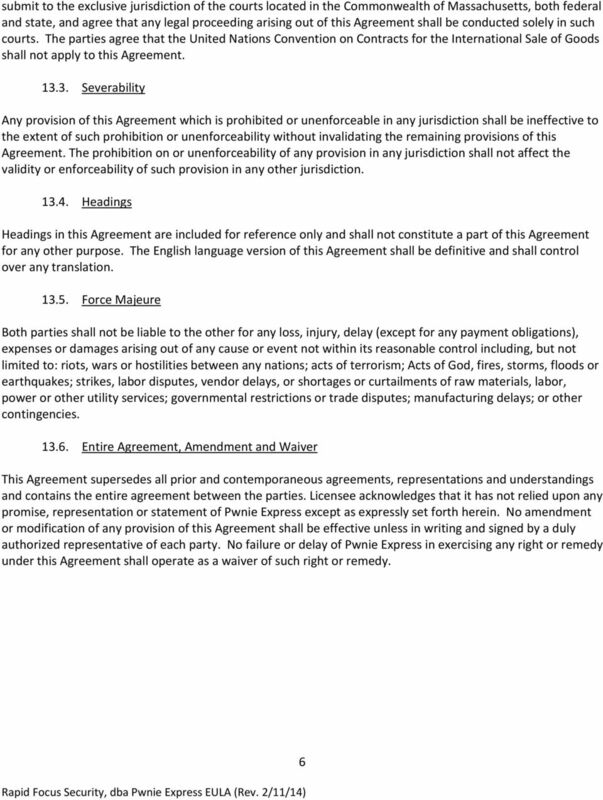 WE RECOMMEND THAT YOU PRINT OUT AND KEEP A COPY OF THIS AGREEMENT FOR YOUR FUTURE REFERENCE. Agreement. Whereas, ThinkGeek is interested in creating products based on the Idea. 1.1 Authorized User means an employee of Customer who has been issued a User ID in accordance with Section 3.2(a). BLUETOOTH SPECIAL INTEREST GROUP SMART STARTER KIT (NO OBJECT CODE SAMPLE SOURCE CODE AND DOCUMENTATION ONLY) END USER LICENSE AGREEMENT PLEASE READ THIS END USER LICENSE AGREEMENT ( EULA ) CAREFULLY. Affiliate means a legal entity that is owned by or under common ownership with Stratus Technologies Ireland Limited. C. System Requirements. Apple Software is supported only on Apple-branded hardware that meets specified system requirements as indicated by Apple. PLEASE READ THIS AGREEMENT CAREFULLY. BY INSTALLING, DOWNLOADING OR OTHERWISE USING THE SOFTWARE, YOU AGREE TO THE TERMS OF THIS AGREEMENT. 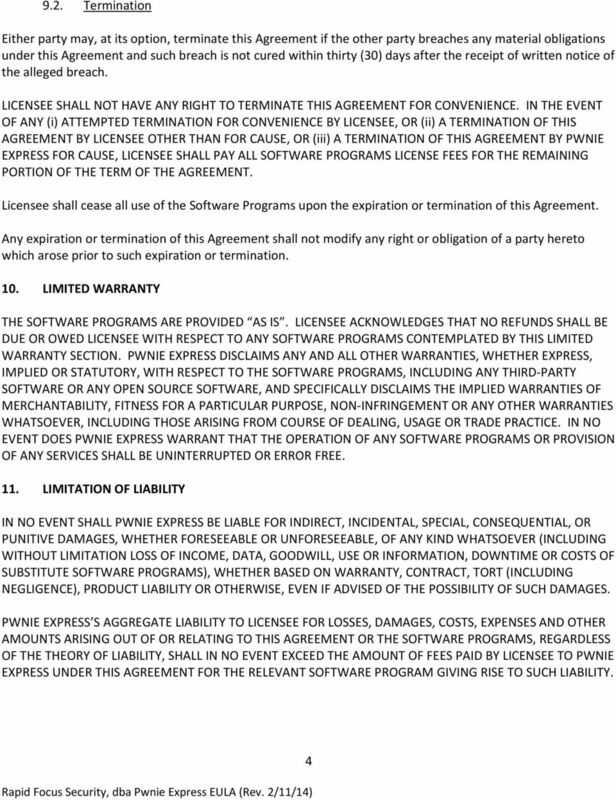 NON-EXCLUSIVE SOFTWARE LICENSE AGREEMENT FOR MICROCHIP USB FRAMEWORK SOFTWARE IMPORTANT - READ CAREFULLY. IMPORTANT: MICROCHIP TECHNOLOGY INC. ("COMPANY") IS WILLING TO LICENSE USB FRAMEWORK SOFTWARE AND ACCOMPANYING DOCUMENTATION OFFERED TO YOU ONLY ON THE CONDITION THAT YOU ACCEPT ALL OF THE FOLLOWING TERMS. FILEMAKER PRO ADVANCED SOFTWARE LICENSE IMPORTANT -- READ CAREFULLY: BY INSTALLING, COPYING, DOWNLOADING, ACCESSING OR OTHERWISE USING THE SOFTWARE, YOU AGREE TO BE BOUND BY THE TERMS OF THIS LICENSE. prevailing of JAMS/Endispute. The arbitrator's award shall be binding and may be entered as a judgment in any court of competent jurisdiction. THIS EULA SHALL APPLY ONLY TO THE SOFTWARE SUPPLIED BY EVOLPHIN HEREWITH REGARDLESS OF WHETHER OTHER SOFTWARE IS REFERRED TO OR DESCRIBED HEREIN. GENERAL TERMS. 1.1 Hardware refers to the computer equipment, including components, options and spare parts. If a Client and a Freelancer enter an independent contractor relationship, then this Freelancer Agreement ( Freelancer Agreement ) will apply. EmoeHost agrees to provide to Client the Services agreed upon between EmoeHost and Client as selected by Client at www.emoehostmaine.com.